The year is 1964. After his latest round of projects, a contractor finds he still has a lot of little architectural decorative bits left in his supply yard, none of them enough to work on any one building by itself. What to do, what to do? Find the next client that walks in the door and just throw everything at their project! 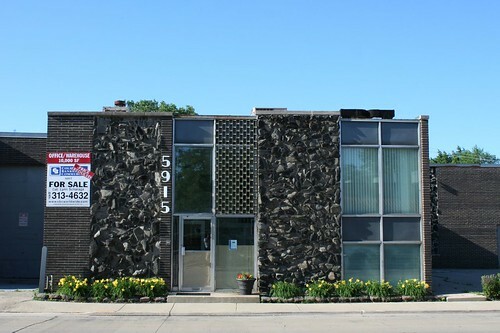 At least, that’s the story I picture behind the building of North American Heating and Air Conditioning, 5915 Lincoln Avenue in Morton Grove. The tiny office portion of this building packs a grab bag of architectural materials, including a brown brick, black lava rock, and metal spandrel panels. 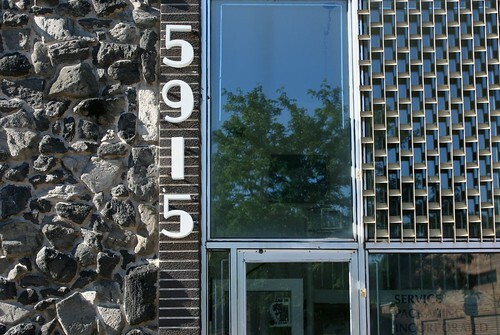 Adorning it are a bronzed window screen, funky Mid-Century address numbers, and three columns of randomly spaced colored glass block dripping down the side. 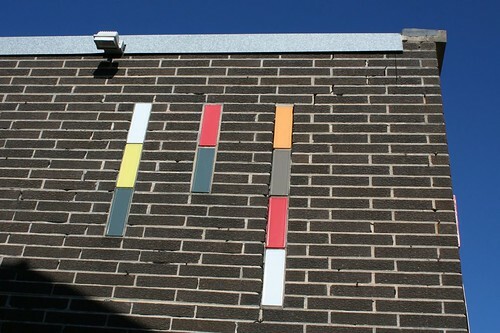 If that ain’t enough, a brick and pattern block fence once lined the parking lot, too, with brick posts topped by lamps. The end result is just way too much stuff packed into one tiny facade, but I love it. 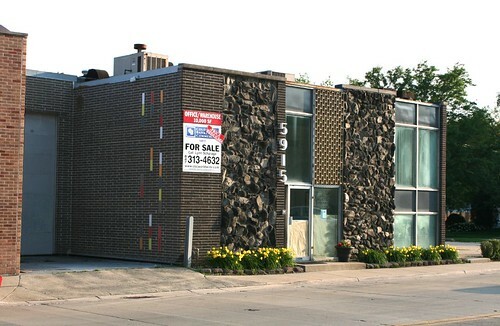 This entry was posted in Architectural Ornament and Materials, Lincoln Avenue, Mid-Century Office and Commercial, Midcentury Modernism, Sculptured glass block. Bookmark the permalink. Melville Philip Steinfels, I like you pictures of the mosaics and would like to use them on a blog about the project, I have been posting pixs on my FB page. Please take a look, David Lee Csicsko, Loyola New Nursing School Project. I also designed the mosaics at the Belmont CTA station, and designed the new chapel at the new Ann & Robert H Lurie Children’s Hospital of Chicago. I look forward to hearing from you. Again lover reading your postings. As a fan of Chicago architecture and the stories behind the buildings your blog is always a pleasure to read! I now live in the vast architectual wasteland of South Florida. The thing I miss the most about Chicago are the buildings and exploring the alleys. Thanks for sharing your love of Chicago. Only few knows about this amazing architecture of Chicago, I really liked your post and will wait for few more architectural stories.